Look! Virginia beat #1 ranked Miami last night. How about that! But, when I’m up and out early on Saturday, I get to listen to the sports program Only A Game on National Public Radio during my drive to the studio. Almost every week I hear a story and think, “I really wish you could hear this.” And, by “you,” I really do mean you – whoever you are. I mean “you” … everybody. Today’s show deserves your ears. 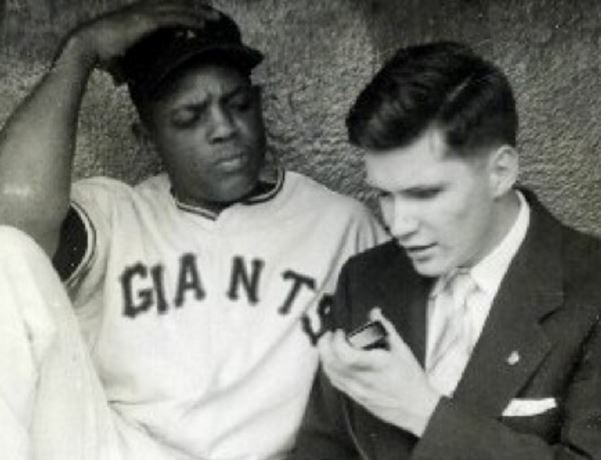 Ed Lucas Interviewing Willie Mays in 1957. Ed Lucas’ story is a story of … how, as a small boy and newly blind, he met Yankee Phil Rizzuto, who took him under his wing … how Leo Durocher opened the Giants’ clubhouse doors to him, as a favor to Ed’s mom who thought a visit with baseball players would cheer him up … and of how his life blossomed despite blindness. It is a story of baseball and of family. It is beautiful. You can listen to, or download, the story here.